These half, one, two or three day workshops or one day demos are ideal for people wanting to learn about the Tellington TTouch Training Method, Functional Canine Enrichment or Real Dog Yoga for their own dogs or dogs in their care. Any dog is welcome on the workshops and demos. The only rule for workshops is that your dog is safe and happy to mix with other dogs and people in a hall situation and is vocally un-intrusive. The Truth about Wolves & Dogs, which accompanies her highly successful book. All events listed are taught by Toni Shelbourne; however some are organised by other people. For information or to book please contact the person listed for the workshop you are interested in. 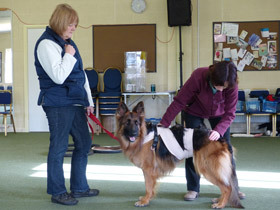 ‘Excellent day - I thoroughly enjoyed the seminar and would recommend it to anyone who has any interest in dogs. I think it was suitable for both dog trainers and dog owners’. ‘Enjoyed the seminar very much - Toni is a great orator, speaking with a relaxed manner, that is perfect for the audience to absorb what is being said. Interesting and informative with an air of fun, I thought it a superb talk that held my concentration throughout. It reinforced much of my present thinking towards my canine family members but loved the information that was new to me and am sure my dogs will thank you very much for helping me understand them better’. Staff training days for rescue centres, assistance dog organisation etc. For a diary of events click here. Please contact Toni for details on how to host an event. If feasible she is able to teach anywhere in the UK or abroad.